Dinghy racing is a tremendous way to improve your abilities while having lots of fun at the same time. One of Kinghorn Sailing Club's greatest assets is the spread of talent amongst its members. This means, no matter what level of ability you have, there is bound to be someone with whom you can have a close race with and swap notes at the end of the day. 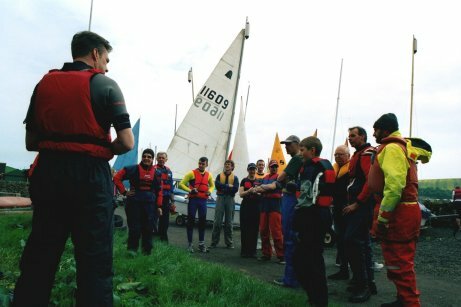 The bulk of the club's racing takes place between October and May on Kinghorn Loch. The small, tricky loch provides challenges for all skill levels. The other huge attraction about the winter sailing season is that, unlike virtually every other club in Scotland, Kinghorn doesn't take a break over the winter period. This means that all members have the opportunity to practise their skills and keep on form to prepare for the next summer season on the Forth. Racing also takes place on scheduled days on the Forth during the summer. Members listening to a pre-race briefing. 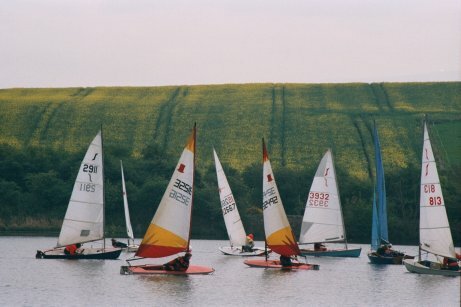 Spring racing on Kinghorn Loch.